It's Friday. Don't forget your horsemeat. 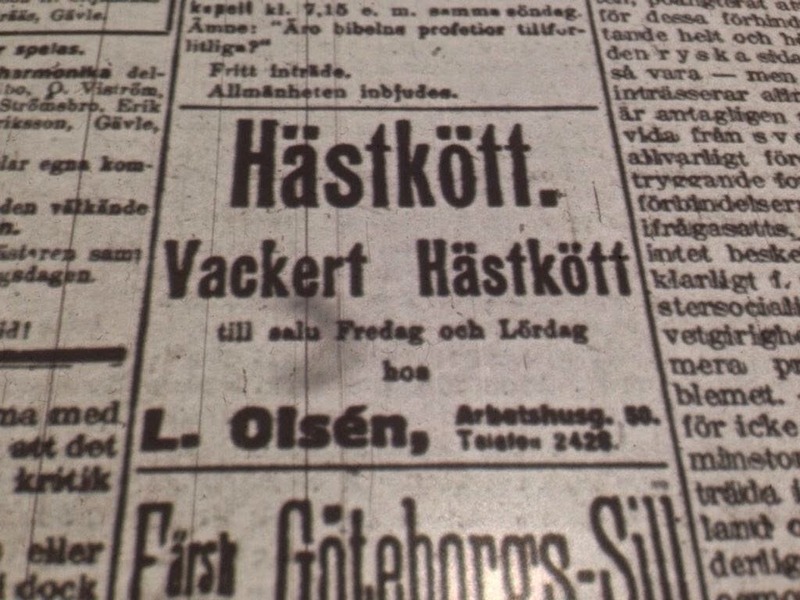 From the January 22, 1920 issue of Arbetarbladet. The US tends to recoil at the thought of eating horsemeat. I’m painting with broad strokes here, but plenty of people view horsemeat as akin to slaughtering cute baby seals. Kicking puppies. Hating freedom. Devising dastardly deeds. It’s taboo, to say the least. I'm accepting hand modeling gigs. So I should come out and say it. I don’t slaughter cute baby seals. Or kick puppies. Or hate freedom. Or even devise dastardly deeds. I do, however, eat horsemeat. At least while in Europe. I’ve eaten it as a steak in Iceland. It was delicious. But more commonly, I eat it as a cold cut here in Sweden. Maybe that makes me a bad person, but I eat meat. And horse is a meat when it is in my refrigerator. It's even more of a meat when it is in my lunch, which for the past two days has consisted of toasted bread, some mustard, some cucumber, and three slices of horsemeat. Or, as the sneaky Swedes sometimes like to call it: hamburgerkött. Hamburger meat. Sneaky sneaky Swedes. That’s not hamburger. That’s horsemeat. Smoky, salty, delicious horsemeat. I prefer the brands that just right out and tell me what I'm eating. Like the picture to your left. That ad for beautiful horsemeat may have been from 1920, but the horsemeat industry is alive and kicking (see what I did there?) here in Sweden. 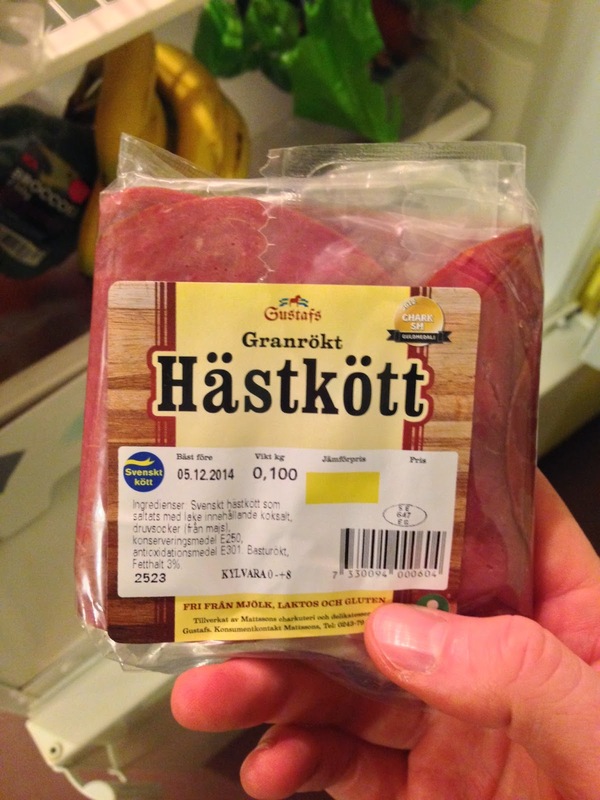 Turns out that about 400 metric tons of horsemeat is imported to Sweden every year. On average, Swedes eat 200 grams of horsemeat each year. That’s not a whole lot per person, but, considering horse slaughter was illegal in the US for several years (legal again since 2011), I’m going to go out on a limb and say it’s probably more than the average in the US. It seems that plenty of people are against horsemeat because horses are smart, they are sometimes pets, they help us work, they symbolize freedom and the openness of the plains, they are big and pretty and majestic and on and on and on. Fine. People like horses. Of course, they never were stuck on the back of Joker, the meanest (and last horse) I ever rode at the age of 10 near Granby, Colorado. Since that day, I have found myself mucking out stalls with dressage horses eyeing me. I have placed horse hooves between my legs (against my better judgment) to clean the gunk out of them. I have fed them and led them and brushed them. However, I have never ridden a horse since I was 10. But I sure as hell have eaten one. Welcome to Sweden. And the sweet (but mostly salty) taste of revenge. Wait. That sounds pretty messed up. How about this? Welcome to Sweden. And the horse with [one] name: hamburger. Welcome to Sweden. And yet another Swedish food that Americans fear. I'm 'Merkin, and I'm OK with Swedish Hamburger. If we can eat other large land mammals, why not horses? What's the emotional connection? Now, I WOULD have trouble eating pinnipeds, but I wasn't raised in a culture that did that. I think you nailed it, Ron, when you referred to the emotional connection and the cultural aspects playing such an important role in what we deem appropriate to eat. And Loba, I had to look it up also. Walruses and seals and such. Anyone who eats dead bodies and drinks blood is no less a uncivilized in real terms vampire, pos. One thing is for sure. You who do this are cursed. You are cursed by the souls you have defiled and by those who wanted to live. You will reap the terror that you have sewn, and rightly so. Be aware that the ghoul of trauma and hell follow you, and it is hungry.